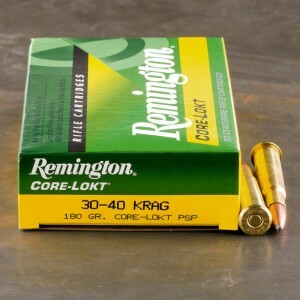 While 30-40 Krag ammo was originally called a small bore cartridge in 1890, the 30 - 40 Krag is a full sized 30 caliber cartridge designed for the United States Military. The round was developed for use in modern bolt action repeaters at a time the military and the rest of the world was transitioning to smokeless powder. 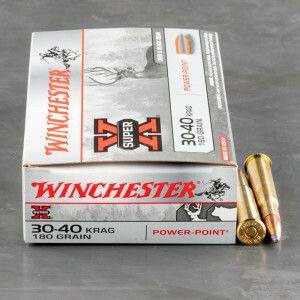 The 30 - 40 name comes from the old black powder method of naming cartridges, for example the 45 - 70 was a 45 caliber bullet backed by 70 grains of blackpowder. The Krag Jorgensen was the rifle adopted and the 30 - 40 became the 30 - 40 Krag. This cartridge served throughout the Spanish - American War. The round performed well with it’s 220 grain metal jacketed cartridge bullet loaded to fire at a 2,000 feet per second velocity. The round was popular and even had it’s own jingle, “Under a starry flag, civilize ‘em with a Krag” Back in the states the round became a popular working cartridge and excelled as a medium game hunting round. 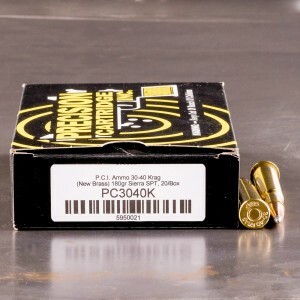 Excellent quality ammo, works great !